I used a large wicker basket with a handle to start (it was about 16 inches long). I then placed the smaller basket standing on its end inside the first one to make the "canopy" and hot glued it into place. 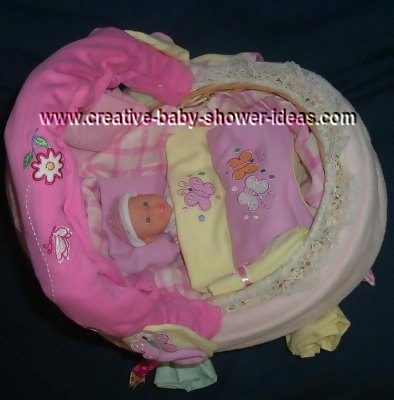 I think you can actually buy wicker baskets that already look like a bassinet. I covered the bottom with a nice plush blanket. 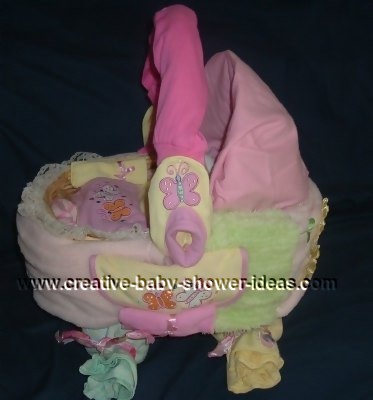 The handle is covered with a sleeper and the canopy is covered with a receiving blanket. These were all secured with either safety pins or straight pins. The "wheels": one was a baby bottle and the other a bottle of baby powder wrapped in receiving blankets with ribbons tied on both ends. On each side where the handle meets the buggy are booties. This carriage craft idea was featured on Good Things Utah Get all the adorable details we presented on the show. 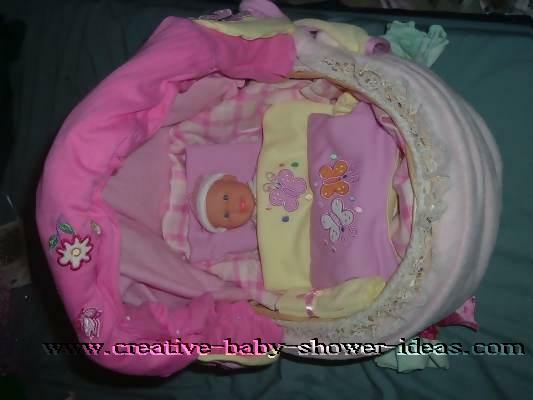 Inside the buggy is lined with a receiving blanket and the "blankets" are a matching T-shirt and onesie folded to cover the doll. I also attached bibs and washcloths here and there for extra decoration. Most of these items can be changed up - i.e you could use all onesies, or all receiving blankets. I had bought a pack of receiving blankets and then I had a gift pack with the t-shirt, onesie, bib, booties and washcloth in it. So I just used stuff wherever it worked. Thank you so much for sharing your adorable craft with us Janice! Simply beautiful! I love how cute it turned out. I am sure it was a hit at the party!